Study Abroad Office Will Open Late Sept. New Assistant Dean to Be Selected by Nov.
A search is ongoing for a new assistant dean to head the Study Abroad Office, which is slated to open at the end of September. The new assistant dean is expected to take office by November. As freshmen gathered under the blazing sunshine in Killian Court for their class picture, few could have anticipated the intensity and drive with which they would soon be pursued by upperclassmen with cryptic symbols emblazoned on their chests. The new school year has rolled out improvements to MIT’s shuttle services, including the addition of two new buses and the expansion of access to ShuttleTrack. Additionally, the Northwest and Daytime Boston shuttles will run all year. 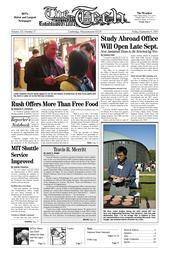 Travis R. Merritt, a professor emeritus of literature whose enthusiastic service over four decades at MIT included taking leadership roles as dean for undergraduate academic affairs and director of the Experimental Study Group, died on Sept. 2, from a heart attack following a lengthy illness. He was 71. The following incidents were reported to the MIT Police between Aug. 29 and Sept. 2. This summary does not include incidents such as suspicious activity, false alarms, general service calls, medical shuttles, or isolated incidents of theft.